In my previous post I discussed the unique aspect of the West: the Adventure. The Adventure begins with a call or summons to begin a discovery. The call requires the cardinal virtues of wisdom and courage: wisdom to look forward and recognize the call, and courage to leap into the adventure that is illuminated by wisdom. Both of those virtues had to be attained prior to the adventure; as such, the Journey segment was needed to develop these virtues. The adventure itself is the trials and temptations encountered to secure the boon, which was the reason for the adventure in the first place. The training and exposure activities of the Journey, coupled with the cardinal virtue of moderation earned during the Journey or the Adventure, are required to seize the boon. The return back to the everyday world requires the cardinal virtue of justice and the love of the hero’s neighbor. Justice is the concern for the community of the adventurer earned during the Journey or the Adventure. Without this virtue, the adventurer would simply remain in the adventure, refusing to return. The love of his/her neighbor is what pulls the hero across back to the everyday world with the boon intact. So, what does this all mean. Well, the adventure is the connection between the Journey (shared by all religions) and happiness (shared by all religions). This Western concept (not shared by all religions) is what pushes the individual to the top of Maslow’s pyramid – self-actualization. It is a concept of great myths as uncovered by Joseph Campbell. It is what brings happiness to the individual and flourishing to society. The flourishing then can be used to help others prepare for their road to happiness. Final comments in my next post. This entry was posted in Uncategorized and tagged Buddhism, Campbell, happiness, hinduism, Islam, Maslow on September 1, 2014 by oliver. As mentioned in my book, Maslow (one of the three modern thinkers referenced) has been criticized for a lack of rigorous scientific testing of his Hierarchy of Needs theory. He himself has admitted to a less quantitative and more qualitative approach in constructing his theory. The proof was finally revealed in 2011. In an exhaustive study, researchers at the University of Illinois put Maslow’s ideas to the test with data from 123 countries representing every major region of the world. The above statement regarding achieving happiness without the lower needs being met applies to those from poor countries. Their expectations of having one’s basic needs for food, water, shelter, as well as the safety needs of protection from criminals and war, are not completely satisfied as they would be in more advanced countries. In other words, excluding the basic needs being satisfied, the findings of the research indicate that the order of needs satisfaction basically follows Maslow’s theory. The research also indicated that people are more likely to achieve happiness when others in their society also have their needs fulfilled. This final point supports one of the premises of my book that the happiness of the individual leads to the flourishing of society. These findings seem to support the work of Joseph Campbell regarding the stages of the hero, also discussed in my book. The complete research article can be found by Clicking Here. This entry was posted in Uncategorized and tagged Abraham Maslow, Hierarchy of Needs theory, Maslow, Maslow's theory on June 23, 2014 by oliver. 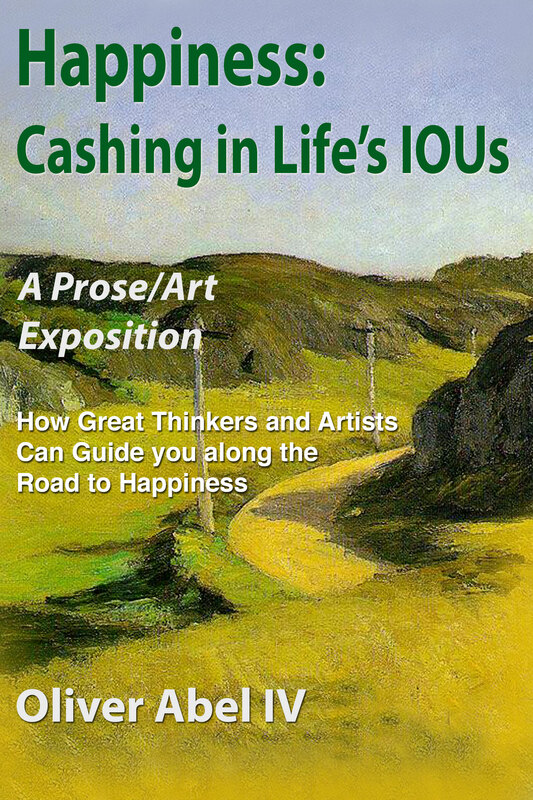 In my two previous posts I presented the works of Eakins and Degas. Both of these two artists presented individuals that have attained happiness. The artworks depict masters of their respective occupations who have achieved Maslow’s self-actualization level, Csikszentmihalyi’s unity with universal values, and Campbell’s ability to cross between the spiritual and everyday worlds with contaminating the one with the other. In both artworks, the main character appears suspended, distant from the others but still present in the scene. In fact, none of the other characters in the scenes are looking directly at the main characters; again, reinforcing the separateness of the main characters from the everyday world. Below is a third representation of this depiction of individual happiness by another great artist. Attention is now on the isolated grandparents, who as a couple, accepted the call to adventure and sacrificed through hard work and dedication for the successful upbringing of their family. Their journey’s accomplishment is illustrated by their humble gestures (grandmother cooked for all the others to enjoy) and the successful gratification of their offspring’s physiological and safety needs – most assuredly the grandparents’ quest. 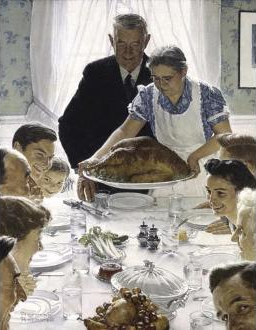 Just as in the two paintings mentioned in the previous posts, the characters seated at the table in this painting are not looking at the two main characters standing. The two grandparents are almost hovering above the table, isolated from the conversations of those seated at the table. This entry was posted in Uncategorized and tagged Csikszentmihalyi, happiness, Joseph Campbell, Maslow, rockwell on April 18, 2014 by oliver. I would like to turn to the great masters of the fine arts to further explore the achievement of happiness: Maslow’s final level of his hierarchy of needs, Csikszentmihalyi’s forging a unity with universal values, and the ability of Campbell’s hero to go back and forth between the everyday world and the spiritual world. I would like to focus first on the individual and then later turn to the flourishing of society. The fulfillment that is encountered upon reaching happiness is a completion of one’s destiny or mission in life. The life that is experienced by those in true happiness is one free from all fears and human desires, competitiveness, striving, fatigue, and personal ambitions. Let’s look at one master of the art world. This is a work showing in stark gruesome realism the mastectomy of the woman lying on the operating table and the surgeon/instructor standing to the left. It depicts the surgeon as the teacher/hero to those in the surgical circle as well as the stands. He is self-sufficient and independent from the others in the painting. He is able to go back and forth from the relaxed and fulfilled world of an esteemed teacher to a noted surgeon (depicted with scalpel in left hand) in the everyday world of medicine. 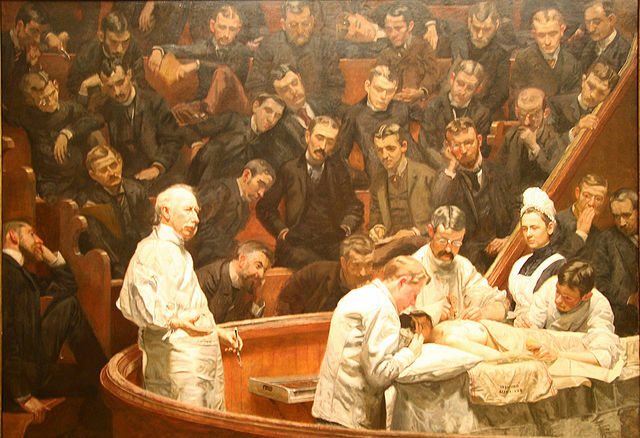 Not one character in the painting is looking directly at the surgeon/teacher – it is as if he is not present. But the viewer sees him as one that is confident, free of all desires and ambitions, and fatigue-free and alert to his surroundings and duties. He is free to go from the everyday world to the spiritual world (in which he is seen standing) at his discretion. The surgeon/teacher has no need of attention or praise from others – he is above all that and perhaps witnessing peak experiences. This entry was posted in Uncategorized and tagged Campbell, Csikszentmihalyi, Eakins, fine arts, happiness, Maslow on April 4, 2014 by oliver. Continuing with my previous post, one fundamental question that I have asked in the past is: Why do many risk so much on something that others consider to be saturated with uncertain odds of success? We now have the answer to this elusive question: By doing so the individual has the opportunity to travel well beyond the successes of ordinary life. Capitalizing on opportunities today, considered risky by others, provides a chance for a future lived well above that of an everyday existence. This entry was posted in What is Happiness? and tagged happiness, Maslow, self-actualization on March 7, 2014 by oliver.